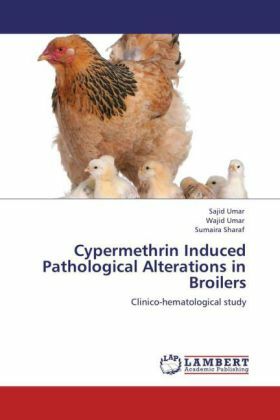 This study was carried out on 90 one-day-old broiler chicks to know clinico-hematological alterations, DNA damage caused by cypermethrin (CY), and attenuation of toxic effects by vitamin E (Vit E) and selenium (Se). Birds were randomly divided into five equal groups.Birds were monitored twice daily for clinical signs. They were weighed and blood samples were collected for hematological studies. CY-treated birds showed more prominent signs of toxicity compared to CY+Vit E, CY+Se and CY+Vit E+Se birds. Body weight in groups 1 3 was significantly (P0.05) smaller at days 20 and 30 when compared with the control group. Significantly (P0.001) higher numbers of micronuclei appeared in chicks treated with CY compared to CY+Vit E- and CY+Se-treated birds. Significantly decreased total erythrocyte counts (TEC), hemoglobin (Hb) concentration and packed cell volume (PCV) in all treated groups were recorded.It can be concluded that CY induces toxic effects in broilers chicks; however, these toxic effects can be ameliorated by Vit E or Se. Combination of Vit E and Se was more effective to ameliorate toxic effects of cypermethrin.